The Khaliman Republic is an elite faction. His game is very strategic, all choices are important and must be well calculated. The slightest wrong decision or activation can mean the loss of a miniature or a decisive advantage not exploited. This strategy applies as soon as the troop is formed. The latter, less a catch-all than a populous faction, must be carefully thought out. It aligns quality but quite expensive troops, and relatively cheap heroes. The average of the Khalimans’ set of characteristics is higher than those of the other factions of the game. Because of the cost in points of their miniatures, the Khalimans are almost systematically outnumbered. In addition, their troop compositions are often very specialized for the same reason. Individually stronger than their counterparts, the Khalimans are very comfortable with movement scenarios and scattered fights, taking advantage of their strength and speed to attack the opponent at the most opportune moment or to play the scenario before this last. The smallest miniature can get away against an opposing counterpart, however, we must be very careful about the numerical inferiority, which can hurt most of the miniatures. If the troops are very specialized, the heroes are rather versatile (with a few exceptions), being very good scenario players thanks to their numerous Action Points and their high values of Defense and Movement, in addition to their other possible uses. Do not hesitate to play on their abilities to reactivate to delay and attempt to overcome the sub-number. Strong points : The Khalimans align several major assets with the other factions. Their main strength comes from their characteristics. Even the cheapest miniature has features reserved for elites in other factions. These features give them serious advantages in combat. They often have the initiative and are less sensitive to alchemical formulas and negative skills like Scary. They strike most often first, and are less afraid of attacks by enemy base troops, especially if they are injured. Among other benefits, all their heroes and alchemists have more than one Defense of 12, the best of the game. Finally, all Khalimans have a high movement, allowing them to choose their target or to play the scenario, often from the first round. 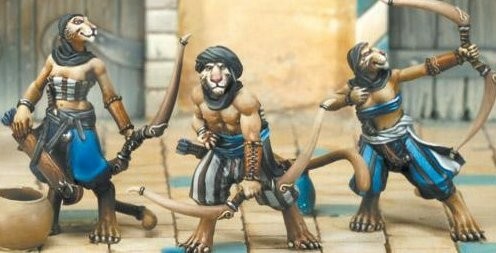 Weak points : Despite high features, and with the exception of a few references, Khaliman miniatures have few Life Points. Each loss is difficult to compensate and the least attack of the lucky opponent can wreak havoc, the Khalimans require great finesse of use, and this for all of their miniatures. They are especially afraid of opponents with combat-oriented elites. The player will have to choose very carefully his fights and his activations. 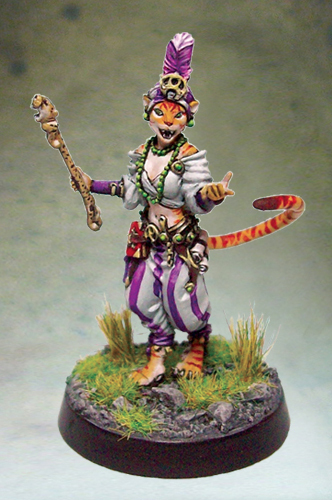 Alchemists as well as some miniatures with special effects like Djinn or Khabircheik require mastery and a flawless placement. Araoui is a hero with dual use. 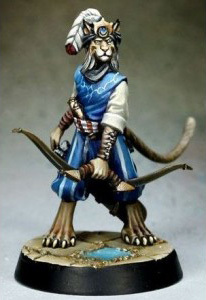 Depending on the scenario and the opposing list, he may choose to play first or to stay indented and use his bow. However, if he shoots, he loses the ability to defeat the charges against him. Araoui is an excellent shooter, despite average damage. He is especially formidable for his ability to make four shots per lap, and to ignore the cutlery on some of his shots. He is thus a threat for all enemy models, wherever they are. Iecha is an alchemist Khalimane oriented on the attack. His Alchemical Scimitar and the many abilities he brings in addition to his high damage, can turn into a monster. His first formula is more circumstantial, but may allow some roguery towards the opponent, forcing him to play the Combat Cards you have chosen. 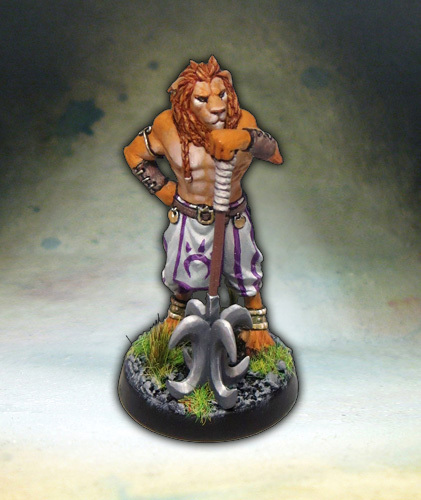 His large number of Action Points allows him to easily combine combat and scenario. 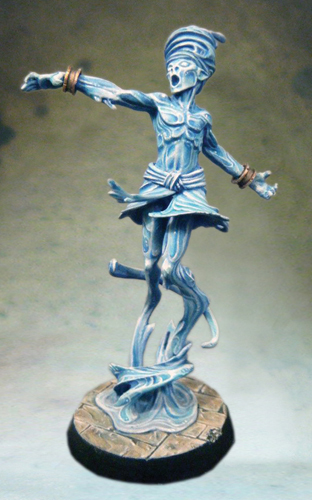 Finally, she is an evocative and therefore has several interactions with Mahritin Djinn. Abdelan has the distinction of being an alchemist anti-alchemist. His formulas aim at either canceling the effects of enemy formulas on allies or opponents as well as copying the alchemical formulas of the opponent to return them against him. Strategically huge, it nevertheless depends on the presence of an alchemist in the opponent. It remains in the absence of the latter perfectly fit to play the scenario, devoting its four Action Points, turn for only 39 points. 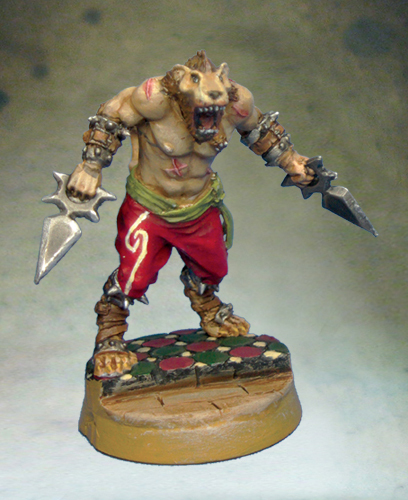 Hakim is one of the iconic miniatures of Khalimans. It is entirely focused on the scenario game. It is very difficult to attack in Close Combat and also has a permanent ability forcing any model within range to pay more for any combat action, charge, fire or alchemy. Thus, he can easily wander in the opposing lines to play the scenario and penalize the opposing figures. Be careful though that his power does not turn against his allies! Ibrahim is a very combat-oriented hero. It has almost no defect, if not its very high cost for a miniature that has only three Action Points. The Long reach and Sequential skill pair, combined with very high stats and a good damage table, allows him to tackle any type of opponent. It can both clean the troops and attack the elites and heroes. If there is one thing he does not have to play, it’s the scenario, it would spoil such martial abilities! Dahlia is a versatile miniature. Four Action Points and an ability to force the opponent to activate a card allows the troop some management of activations. She also has good Combat and Reflex skills but a fairly small damage table. It is therefore perfect to play the scenario or to attack enemy base troops. She is finally a very good leader. Its ability to recruit up to four Ghulams and boost them is circumstantial but allows interesting list compositions. Its main utility lies in the fact of offering free reactions to all allies within reach, provided they have no more AP. Thus allies can play the scenario without fear of being too vulnerable to attack. 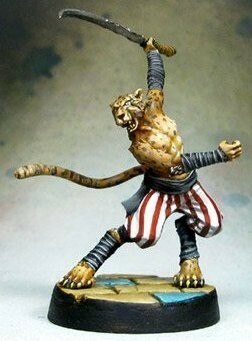 And on elite miniatures or even Ghulams, it will not make the opponent laugh at all. His second formula, though easier to cast, is more anecdotal in its use but can save an ally from a calamitous dice roll. 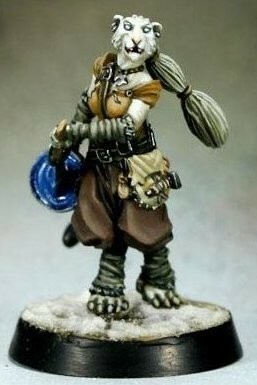 Alchemist of the Inner Circle, it is perfect to accompany a Mahritin Djinn and even allows to recruit up to two copies. Gadget, but scary. His alchemy works atypically. His formulas allocate him a certain number of markers, depending on his concentration. She can then spend it to help reduce the damage done to allies and their last to use white dice regardless of their health. The Jaraya is the basic troop of the Khaliman Republic. Versatile, though expensive, it outperforms other factions’ base troops and will be useful in all situations. They can as well face the troops as play the scenario. The support of the alchemists allows them to hold against the opposing elites or against an opponent in excess. Medium but mobile and very discreet shooters, Tuaregs can be a thorn in the opponent’s foot. Their special concealment and movement abilities allow them to shoot while approaching. They can easily play the scenario or benefit from Bout’s bonuses on their shots. Be careful, however, never to be hired. A Tuareg in Close Combat is a useless action miniature! 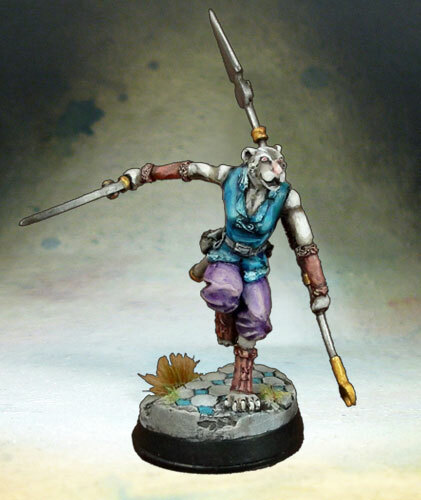 A direct competitor of the Jaraya, the Meharist is a poor fighter, sacrificing good martial skills for defense and superior movement. His exceptional movement allows him to easily cross the table and makes him a great scenario player. It can also be used to quickly attack opponents such as alchemists or shooters. The Ghulams are the shock troops of the Khaliman Republic. Their high Combat and Reflex characteristics, coupled with their excellent damage table make them perfect tools to clear the ground. The Long Reach skill gives them relative safety if they have the initiative to attack. On the other hand, they fear the enemy shooters, because of their weak defense, so you have to play them carefully. Ermadhis Guardians are often dissuasive. The opponent will hesitate to hire them because of their ability to hit free before the fight and will prefer another target. Charge the player to arrange for this target to be protected by the said Ermadhi! They ask however to be played finely because their weak damages do not allow them to hold a long fight. The Der’wish have serious offensive assets and are capable of inflicting a great deal of damage in a few actions through their Chaining. Nevertheless, they are mainly destined to clear the base troops or to finish the wounded. Their average Combat rating for an elite and their low Health Points makes it difficult to attack elite enemy troops. 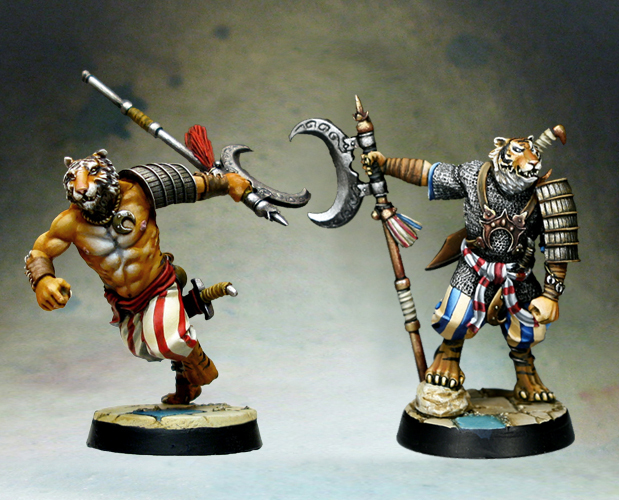 Recruiting a Venator means being able to recruit up to three Khergars. If the Belluary has the advantage of being a three-Action Action miniature for a ridiculous cost, the Khergars are real killing machines. Very fast and benefiting from bonuses if they attack the same target, they are able to overcome any opponent. However, beware of their very low values of Spirit and Defense, making them very vulnerable to some competing skills if the Belluary is not around. Khergars also can not play the scenario. Ifrit’Qaniss is designed to take on elite opponents, thanks in particular to high characteristics and a large number of Health Points. 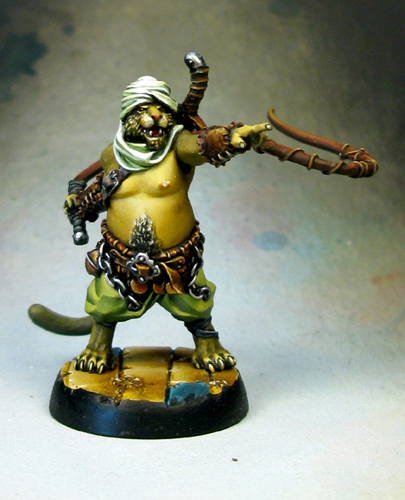 Specializing in the hunt for size 3 miniatures, he is the only model in the game with two Expert skills. It can easily maximize the number of dice in combat to make the most damage. 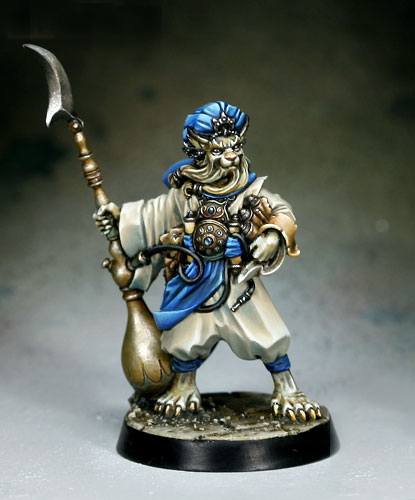 The Djinn Mahritin is the size 3 Khaliman miniature and one of the most affordable in points. It has excellent features but a very progressive damage table. His ability to attack multiple models simultaneously at close range makes him very effective against the opposing forces grouped together. However, he has the default of losing Life Points each round. It is therefore advisable to accompany an Evocatrice who can overcome this defect, and treat during the game.